After a quick look over the list to make sure I hadn't forgotten any I'm left with 17 contenders. Two of which are definites. Now to sift through the other 15. I'm left with 3 possibles. The nearly there's would be The Daleks, I love this story. The Thals, Skaro, the metal city all combine to give us a new villain in a great environment. Dalek Invasion of Earth, I love the threat to Earth, the doublcrossing and the madness of the Dalek's plan. The Horror of Fang Rock, a Gothic tale, the characters trapped in a lighthouse, a sci-fi twist and Tom Baker, excellent stuff. The Five Doctors, for all its many faults this is a memory of my childhood I'm very fond of and still enjoy. The Sea Devils, Iconic imagery, The Master and UNIT. The Time Meddler, a look at other Time Lords and one with a mischievous streak. The Sontaran Experiment, a nice snappy tale and my favourite Sontaran story by a whisker. The Mark of the Rani, don't laugh, I haven't seen this since it aired but remember being glued to the screen. I loved the setting and the spookiness.The Invasion, earth under peril, more iconic imagery and Troughton. Terror of the Zygons, I loved all the characters in this and wondering who was real and who wasn't. Though the Skarasen didn't work too well on screen I love it when DW 'explains' things. The War Machines, my favourite London Skyline feature and a sinister computer villain. I can forgive it the realisation of the actual War Machines. Full Circle, I loved this story as a kid. The prejudice led exclusions and how it actually turned Full Circle. Not too subtle but it worked. Now the two that missed it by a whisker. The Stones of Blood, another gothicy, dark tale with a sci-fi angle. It also has Romana I, she left too soon. The Daemons, I'm becoming a bit predictable here aren't I? I can't help it if my two favourite genres are spooky and sci-fi! Doctor Who mixes the two better than anyone else. The Daemons gave us Bok, a White Witch and the Master as a vicar. It also enforced my belief that barrows, tunuli, etc are dangerous places. Drumroll please. My three favourites are Genesis of the Daleks, a great story leading up to the scenes that everyone remembers. It has Time Lord fiddling, something I always liked. It's a story with my favourite Doctor as well as Harry and Sarah Jane. The scenes of war torn Skaro spook me out. Normally origin stories told after something is ingrained in our minds fall very flat. This one doesn't. It gives us a believable tale, told well. Do these uniforms remind you of anything? 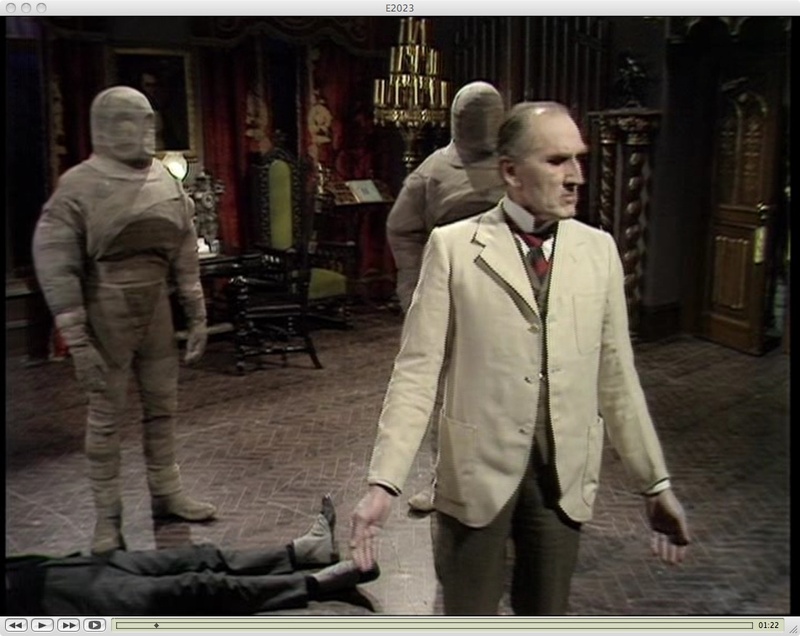 Tomb of the Cybermen, I've mentioned this before in the challenge. I love it through its faults. Troughton, Hines, Cybermats and 'that scene'. It feels deliciously dark too. Pyramids of Mars is probably my all-time favourite. Fourth Doctor and Sarah Jane. Egyptian mummies roaming rural England, a madman who owns a country pile. Mr Bronson!!! The question you have to ask where one tells the truth and the other lies. This is one of the first VHS tapes of DW I bought as a youngster. That probably helped seal it as my favourite but I stand by it's one of the best. I'm a huge fan of Horror of Fang Rock too. And, like you, Romana I went too soon IMO. Not sure about The Stones of Blood though. Part 1 and 2 are great but 3 and 4 are a bit creaky.